On December 18 and 20, 2017, the US Department of Defense issued separate contracts valued at $ 110 million each from the US Air Force Research Laboratory (AFRL) to Lockheed Martin and Northrop Grumman, respectively, for the first stage of developing, on a competitive basis, a promising low-cost aviation cruise missile under the symbol Gray Wolf. 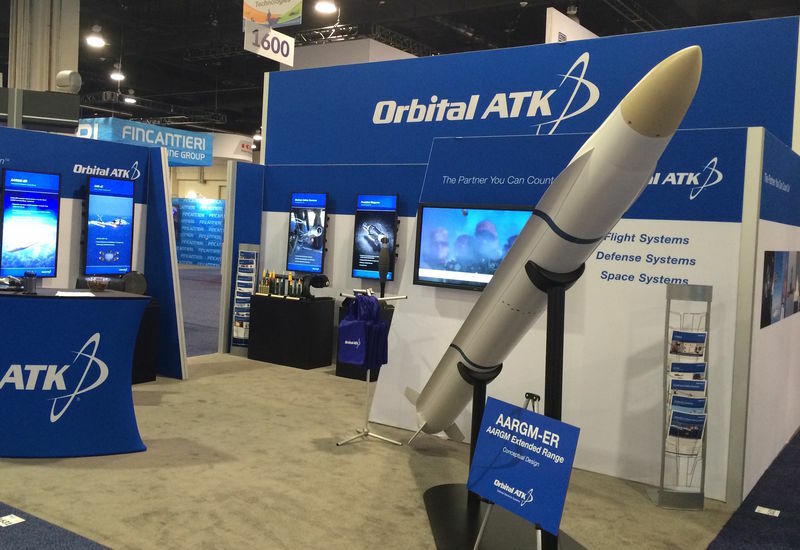 The contracts were issued on the basis of AFL's March 2017 requirements for "designing, developing, manufacturing and testing" prototypes of low-cost subsonic air cruise missiles that should use advanced network-centric communication technologies to combat "integrated air defense threats to the enemy in the face of strong opposition." Thus, the main purpose of these missiles is the destruction of enemy air defenses. The missiles should network-centrically interact with other weapons for joint massive use, mutual issue of target designation, etc. The Gray Wolf program should include four stages of "spiral development" and should provide an opportunity to evaluate solutions using an open architecture and a modular layout that allow the rapid creation of prototypes and improve them in a "spiral development". The missiles must solve the tasks of not only defeating targets, but also surveillance and reconnaissance, electronic reconnaissance and EW. For the AFRL competition, seven US companies submitted their proposals for this program, of which the two projects were chosen. According to the first stage contracts awarded, Lockheed Martin and Northrop Grumman should, by the end of 2022 and the end of 2024, respectively, develop and test prototypes of their missiles on this topic. Earlier, under the budget of 2017, both corporations received $ 3 million for the initial stage of research under this program. Testing of Gray Wolf missiles of the first stage should be conducted with Lockheed Martin F-16 fighters. In the future, the missile should be integrated into the armament of F-35, F-15, F-18, B-1, B-2 and B-52 aircraft. The US Department of Defense issued on September 10, 2018 to Lockheed Martin Corporation a contract worth $ 51.3 million to develop for the US Air Force a long-range JASSM-XR (Joint Air-to-Surface Standoff Missile Extreme Range) missile, which should become an evolution of the in the arsenal of an airborne insignificant subsonic tactical cruise missile AGM-158 JASSM. The contract includes the development and ground and flight tests of the JASSM-XR missile with the completion of works by August 31, 2023. The estimated firing range of the JASSM-XR missile is not disclosed, but previously Lockheed Martin claimed to be developing a modification of the JASSM missile with a range of about 1,000 land miles (1,625 km). The "basic" version of the AGM-158A missile, which has been in service with the US Air Force since 2009, has a officially declared firing range of 230 miles (370 km), and the AGM-158B JASSM-ER option, available from 2014, is "more than 575 miles" (that is, more than 925 km, for a number of unofficial sources - more than 1000 km). According to the information of the American media, the increase in the range of the JASSM-XR missile will probably be achieved by increasing the fuel reserve for the missiles with an increase in the length of the fuselage, as a result of which, perhaps, this CD will be used only on strategic bombers of the US Air Force and will not be used by tactical aircraft aviation. In addition, it is suggested that the JASSM-XR will receive a new lighter warhead (now the JASSM / JASSM-ER is equipped with a 450-kg penetrating warhead WDU-42 / B). According to Richard Scott's Jane's Missiles & Rockets magazine, USN confirms design v for modernized Tomahawk cruise missile, the US Navy officially approved the Block V ("five") designation for new modifications of the sea-based Tomahawk missile in November 2018 , which will be obtained as a result of the program launched to modernize the available cruise missiles of the Tomahawk Block IV version family. In the Block V missiles, it is intended to retool all previously manufactured Block IV missiles by the US Armed Forces as part of the 1534 fiscal year program of extending their service life for 15 years, starting in the 2019 fiscal year. Modernization of Tomahawk Block IV missiles into the Block V variant will be carried out by their manufacturer Raytheon Corporation in two modifications. The Block Va Index (designation RGM-109E / UGM-109E) will receive cruise missiles converted into the Maritime Strike Tomahawk (MST) variant, equipped with a new multi-channel guidance system for the possibility of hitting surface targets. Earlier in August 2017, the US Navy gave Raytheon a two-year contract of $ 119 million to develop the MST rocket. Prior to this, Raytheon reportedly spent $ 55 million of its own funds on MST R & D from 2012. Specific parameters and types of channels of the new homing head for MST are not disclosed, but presumably it will combine active and passive radar and thermal imaging homing channels in combination with a powerful data processor and a new unit of inertial guidance. 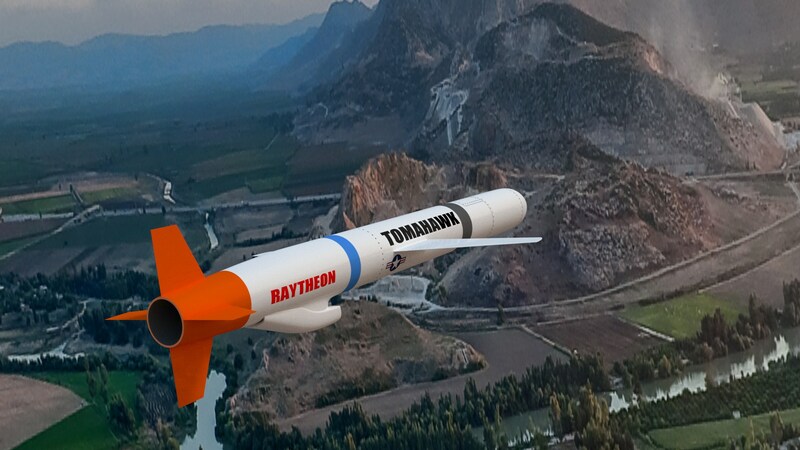 Raytheon is supposed to deliver the first 32 missile upgrades to the Maritime Strike Tomahawk version in 2020 Fin; 50 sets - in 2021 FY, and 80 sets - in 2022 FY, with a total estimated cost of $ 457.9 million. The status of initial operational readiness (IOC) of the MST rocket is scheduled for the third quarter of 2022 FY for upgrading rockets on the Block Va variant in 2023 fin. The Block Vb Index (designation RGM-109M / UGM-109M) will receive missiles that retain the main purpose for hitting ground targets and are equipped with a Joint Multiple Effects Warhead System (JMEWS), which also has enhanced high-explosive capabilities. JMEWS combines a cumulative precharge with a penetrating warhead. At the expense of the programmable single-purpose fuze, air or ground (non-penetrating) undermining of the warhead can also be provided. Testing and testing of the JMEWS warhead was carried out under a contract obtained by Raytheon in 2009, and in December 2017, the US Navy issued a contract to finalize JMEWS. Achievement of IOC Block Vb rockets with a JMEWS warhead is expected in Fin Fin 2022. Also during the upgrade to the Block V level, repairs and partial replacement of elements of the airframe of missiles, antennas, electrical wiring and installation of a new module of data transmission equipment Integrated Single Box Solution will be carried out. It will also install a noise-proof GPS receiver GR5. Now Raytheon has a contract issued in April 2018 for the supply of the US Navy by August 2020 of the last 100 Tomahawk Block IV missiles of the so-called 15th series (Lot 15) and more than their purchase is not planned in the near future. There is also an order to supply a batch of Tomahawk Block IV missiles to the British Navy. However, upgrading to Block V will help maintain the production line at Raytheon, which will allow you to quickly resume mass production of Tomahawk missiles (already in Block V variants) if necessary. 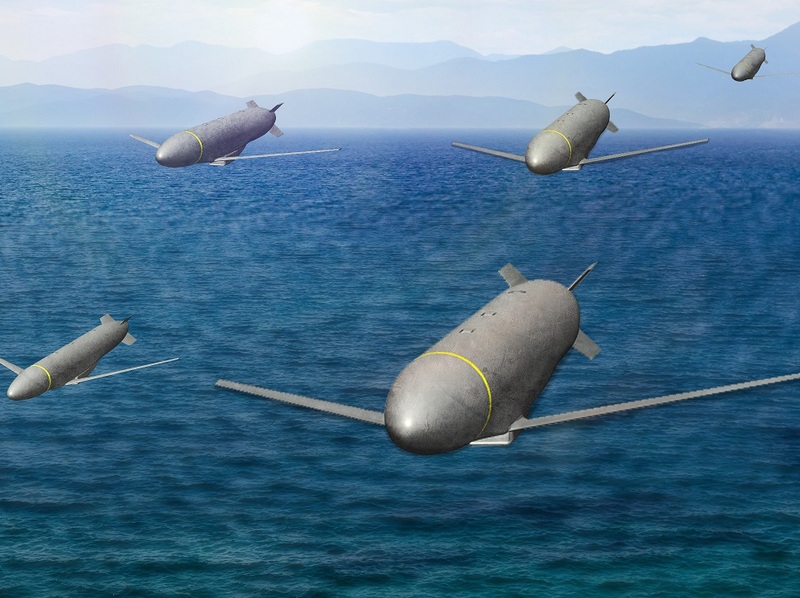 According to the American media, the US Navy on February 7, 2019 decided to issue a contract to Raytheon Corporation to conduct full-scale development work on the Technology maturation risk-reduction (TMRR) and Engineering, manufacturing, and development (EMD) stages for the development of aviation tactical winged JSOW-ER (Joint Stand-Off Weapon - Extended Range) missiles, which should be an upgraded long-range version of the Air Force and the US Navy planning an AGM-154 JSOW (Joint Stand-Off Weapon) planning guided bomb. JSOW-ER missiles in service should be implemented "no later than 2023 fiscal year." The main difference between the JSOW-ER cruise missile and the existing versions of the AGM-154 JSOW planning bomb (engine devoid of nominally) should be equipped with a Hamilton Sundstrand TJ-150 compact turbojet engine (used on the Raytheon ADM-160 MALD aircraft false target). 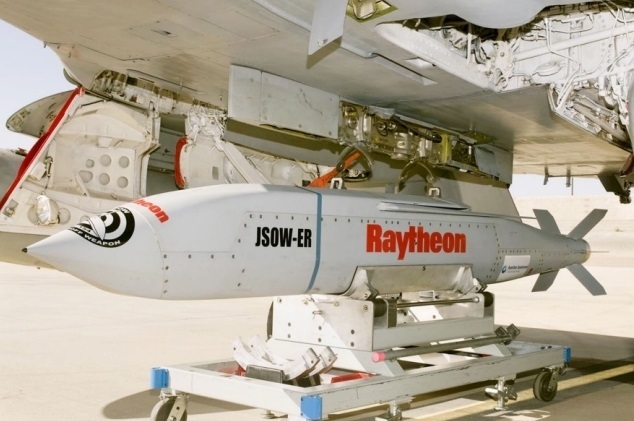 This will provide the JSOW-ER with a predetermined flight range of up to 250 nautical miles (463 km), with Raytheon announcing the possibility of achieving a range of 300 nautical miles (556 km). Now JSOW without an engine has a nominal maximum flight range of 63 miles (116 km) when dropped from high altitudes, and 12 miles (22 km) from low altitudes. JSOW-ER must fully retain the fuselage, dimensions (length 2.69 m) and weight (468 kg) of the base JSOW rocket, but to accommodate the engine and fuel, the penetrating warhead mass will be reduced (now the warhead weighs on AGM-154С-1 JSOW 245 kg). The JSOW-ER missile (like the AGM-154С-1 JSOW) should be placed in the internal compartments of the fifth-generation F-35A and C fighters (the aircraft will carry two missiles). In the Navy and the US Marine Corps, the carrier JSOW-ER must be fighters Boeing F / A-18E / F.
The JSOW-ER guidance system should be similar to AGM-154C-1 JSOW Block III and include satellite inertial correction and infrared homing head type IIR, as well as Rockwell Collins TacNet 1.0 two-way data transmission equipment that uses Link 16 datalink and allows for targeting and re-targeting missiles in flight, as well as guidance to moving targets. The AGM-154 JSOW family of guided munitions has been manufactured since 1999. The US Air Force purchased only 523 AGS-154A JSOW bombs in cluster equipment, and since 2004 they have withdrawn from the program, but the JSOW family is one of the main types of aviation precision weapons of the naval aviation and the US Marine Corps, and is actively being supplied to American allies. 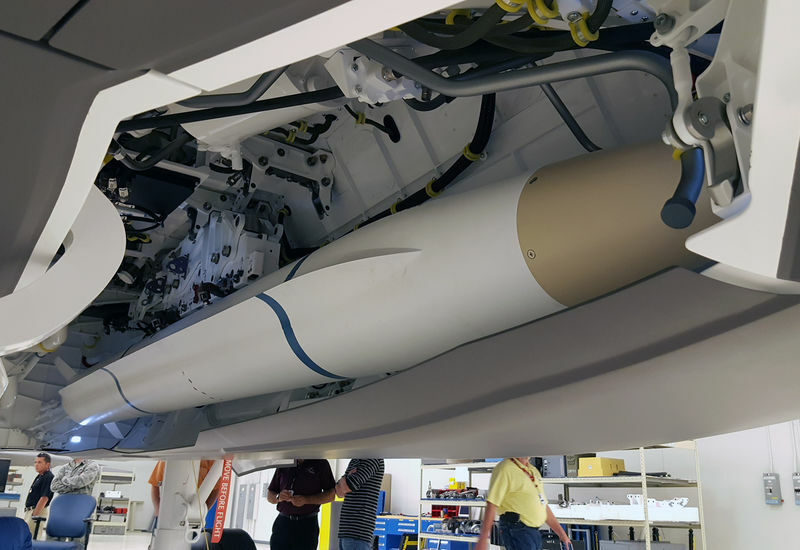 Creating a JSOW-ER will allow you to create a very compact aviation high-precision cruise missile of operational tactical range, much lighter than cruise missiles of the Lockheed Martin AGM-158 JASSM family (weighing more than 1000 kg, length 4.27 km). In this regard, it is believed that the United States Air Force will also resort to purchasing JSOW-ER missiles - first of all, to equip F-35A fighter jets). Raytheon has previously led the development of JSOW-ER on a proactive basis since 2004, and has conducted flight tests of prototypes of this rocket since 2008. In 2017 and 2018, the US Navy issued two contracts to Raytheon for conducting JSOW-ER missile demonstration tests, and their results now resulted in a contract for full-scale development of the missile. Previously, Raytheon also offered an enlarged version of the JSOW-XR turbojet with a claimed range of 900 km as a competition for the JASSM rocket. The command of the Naval Air Systems Command, a Naval Air Systems Command, on March 7, 2019, issued to Northrop Grumman a $ 322.505 million contract for full-scale development and testing (EMD) of the long-range anti-radar missile AGM-88G Advanced Anti-Radiation Guided Missile - Extended Range (AARGM-ER). The missile must be integrated into the armament of the F/A-18E/F, EA-18G and F-35A/C aircraft (that is, it is being created in the interests of the US Air Force). Contract work must be completed by December 2023. The development of the long-range anti-radar missile AARGM-ER was launched in the interests of the US Navy back in 2015 by Orbital ATK, absorbed in 2018 by Northrop Grumman Corporation (and now forming the basis of its unit Northrop Grumman Innovation Systems), and is viewed by Americans as one of the promising means of countering the notorious "access restriction zones" (A2 / AD) of likely adversaries. The AARGM-ER rocket in February 2016 was named by the then US Secretary of Defense Ashton Carter one of the main potential elements for enhancing the US Navy’s strike capabilities in a “strong enemy”, along with the LRASM anti-ship missiles and the upgraded Tomahawk cruise missiles. Structurally, the AARGM-ER rocket uses the AGM-88E Advanced Anti-Radiation Guided Missile (AARGM - further development of the HARM series) anti-radar missile (AARGM), which is used for the guidance and the warhead of the US Navy. increase the flight range. The required range of AARGM-ER is not disclosed, but, according to unofficial sources, will be "more than 60 nautical miles." The rocket body will be made with the introduction of elements of stealth. Thus, the appearance and dimensions of the AARGM-ER will differ significantly from the well-known HARM / AARGM family. The new rocket will be adapted for placement in the Lockheed Martin F-35A fighter jets' internal armaments (F-35B / C aircraft will be able to carry it only on external hangers) - now the HARM and AARGM missiles cannot be used on the internal suspension. Used on the AGM-88E AARGM anti-radar missile and now planned for use on the AGM-88G AARGM-ER, the combined guidance system, in addition to the traditional passive radar homing head, also includes the millimeter-wave active radar channel, inertial-satellite correction unit and two-way data transmission equipment. Such a guidance system is believed to significantly expand the capabilities of the rocket to combat complex modern air defense systems, including in the conditions of radio countermeasures. and enemy use concealment measures and decoys.